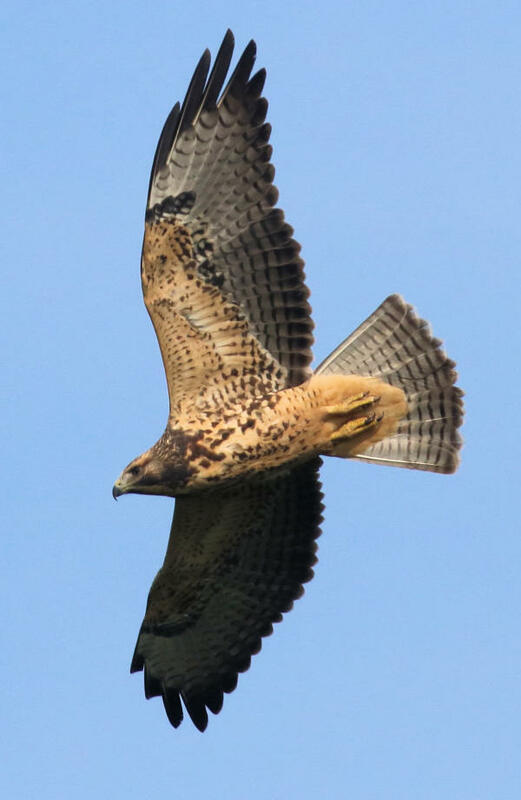 A fine look at a buff-colored Swainson’s Hawk fledgling diving into the wind. Peter started our roundtable visit: Our yard and feeders are flush with fledglings! American Goldfinches are bringing their fledglings to the sunflower feeder, and because I’ve never heard their food-begging calls before I was quite surprised. They are soft and plaintive, and they seem to be working because four young birds flew off trailing two adults. A family of Brown-headed Nuthatches announces their arrival with their toy horn-sounding calls. A group of five worked their way through the pines to the feeding station as we watched last night. Ruby-throated Hummingbird numbers seemed to have peaked last week when they went through eight cups of sugarwater. I saw five hummers simultaneously this morning, mostly females and birds hatched this year. Young Mourning Doves scour the ground under the feeders, the scaly looking feather pattern on their backs and sides gives away their age. Last night, while enjoying dinner on the deck, a flock of about 500 Common Grackles flew over at treetop level. They were completely silent and gave us quite a thrill. Backyard birding is tough to beat! Paul responded with his take on the week: Keeping with the fledgling theme, on Monday evening I was surprised to see what must be the last new robin fledgling of the year outside my bay windows just before the adult male fed it a mouthful of earthworms. The night before, it was fun to see the first of fall Swainson’s Thrush at the same location when I returned from my birding drive. It was inevitable, but disappointing, to realize the last Baltimore Orioles left Monday, a week after the last Orchard Orioles. That forced my hand to revise my feeding station to the change of season. When the orioles began arriving in mid-May, I took my suet feeder down due to overpowering squirrels and starlings. So Saturday I followed your (Peter’s) suggestion in your August 15 Backyard Birding article to use Hot Suet that squirrels don’t like. After all, as much as I enjoyed having the oriole action at my feeding station, I missed the woodpeckers and nuthatches that have largely been absent this summer. I’m interested to see when these birds find my spicy suet. For now, female and immature Ruby-throated Hummingbirds continue to visit my nectar feeder and periodically lay claim to it as one will chase others from the feeding station. They will probably be around a couple more weeks, but I’m surprised no more males are present. Wednesday and Thursday I checked the pulse of raptor migration across the region by counting all the birds of prey during a regional birding drive and during a local birding trip on consecutive afternoons. I described the results of these counts in this issue’s Birding Lifestyles feature. It was great fun to see the diversity and abundance of birds of prey and other birds across this portion of the northern Great Plains, and it was especially satisfying to see and photograph a fine young Merlin. Unfortunately, Friday and Saturday seemed way too windy to do any serious birding, but Friday afternoon I did manage to photograph a trusting Northern Flicker feeding down the street. About 10 miles to the south I also found a new Swainson’s Hawk fledgling with beautiful buffy-tan ventral coloring that was hunting in a newly cut hay field in the company of five adults that had assembled to catch newly exposed voles and mice. Then Saturday, when I least expected it, I found and photographed another duo of new Swainson’s fledglings about 10 miles to the east. So I guess I also had plenty of fledglings this week, in the field and at home. Enjoy your mid-September birding highlights this week!